The Ehime Prefecture Public Wireless LAN Promotion Council is a collaborative effort involving industry, academia and government sectors. The purpose of the council is to help the private sector establish and operate free Wi-Fi spots in Ehime prefecture and offer the convenience of Wi-Fi service to tourists from overseas and other prefectures in addition to local citizens, as well as to promote local communications and activities in Ehime Prefecture through the "Ehime Free Wi-Fi Project." 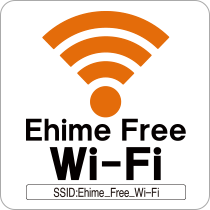 The free public wireless LAN, "Ehime Free Wi-Fi" uses the following SSID and logo in all spots to create user-friendly environments. Use "Ehime Free Wi-Fi" in places like these. For actual "Ehime Free Wi-Fi" Service Spots, please check "Search from map" or "Search from list " page. Prefectual offices & City halls & Town offices etc. There are spots offering services by vending machines with Wi-Fi. (NTT West): Allows access to its own Wi-Fi service, DoSPOT to "Ehime Free Wi-Fi" users. Allows access to its own Wi-Fi service, USEN SPOT to "Ehime Free Wi-Fi" users. Allows access to its own Wi-Fi service, FREE Wi-Fi PASSPORT to "Ehime Free Wi-Fi" users. Allows access to its own Wi-Fi service, Wi2 to "Ehime Free Wi-Fi" users. Offers other participating businesses its preexisting transmission wireless lines. 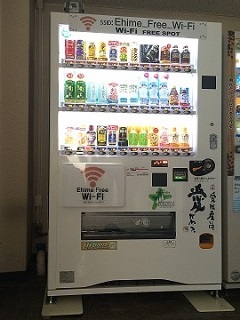 Offers the Wi-Fi Service in conjunction with Wire and Wireless Co., Ltd.
Offers service with a Wi-Fi router built inside of (or placed adjacent to) a vending machine. Provides support to businesses which intend to offer the service on their own. In addition to the above, some facility owners participate voluntarily in the Ehime Free Wi-Fi program to provide free Wi-Fi service. For details, refer to the list of service providers (Group E) (PDF:385KB). To view files in PDF format, you need Adobe Reader. If Adobe Reader is not installed on your device, free download is available from the link on the banner.